Peterborough United have offered goalkeeper Ben Alnwick a three-year contract. Alnwick is one of the players out of contract at the ABAX Stadium at the end of next season. If he doesn’t accept the offer - and discussions have been set up for next week - the 29 year-old will be placed on the transfer list as per club policy. Right-back Michael Smith will also receive a fresh contract offer even though Posh have signed a new full-back in Hayden White. Posh have offered midfielder Erhun Oztumer a two-year deal, but he has yet to sign. There are other Posh players out of contract at the end of next season, but if the club have ‘optional years’ on the current deals they will not be transfer listed. Attacking midfielder Jon Taylor and young goalkeeper Dion-Curtis Henry fall into that category. Contrary to previous reports central defender Ricardo Santos has two years left on his current contract. League Two side Leyton Orient are the only club to have enquired about unwanted Posh left-back Kgosi Ntlhe. 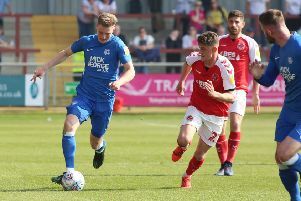 Ntlhe is out of contract and entitled to leave the ABAX Stadium, but Posh are entitled to compensation which would be determined by a tribunal should a fee not be agreed. Posh director of football Barry Fry has revealed that new boss Grant McCann is trying to add two faces to his management team, one of whom is currently employed by a Premier League side. That Premier League side is not asking for compensation so a deal should be finalised soon. Posh are currently chasing three new players, one of whom is the subject of a decent sized bid. The left-sided central defender expected to sign when he returns from holiday is a free agent.